What do you think of when you hear the word “ladylike”? I think grace, elegance, and femininity – qualities every crossdresser and transgender woman should aspire to. The question is – how ladylike are YOU? Take this fun 10 question quiz to find out! How do you greet people you know? You’re at the bar with friends. What do you order? How sexily do you like to dress in public? How often do you swear? What would you do if you accidentally burped in public? What do you like to wear to bed? You’re driving to lunch with the girls when somebody cuts you off in traffic. How do you respond? How often do you say “please” and “thank you”? Which of the following shoes best suits your personal style? Do you ever smoke or get drunk in public? Share your ladylike score in the comments below! P.S. Want to learn my top 10 secrets for becoming more ladylike? 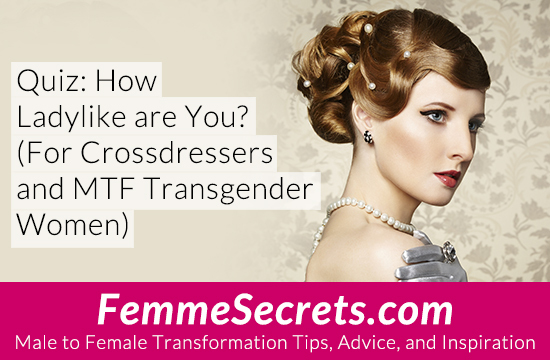 Click here to sign up for my FREE 3-part Male to Female Makeover Course! FREE Teleseminar: Top 10 TG Fashion Questions ... Answered! I wish my lovely wife would accept; and even slightly encourage my crossdressing; and take control and treat me in a feminine nature; maybe even addressing me in my feminine name; “Michelle”. However; I doubt she has it in her nature. I am 83% I live as a women 24/7 and work as a female and I did not get 100%.